Gaétan Alibert, who is not only the PR man for the French record champion Paris UC, but also is writing for the famous French baseball blog Honus.fr, did an interview with Tiffany Brooks. She became the first female baseball pitcher in the 21st century to sign a contract with a professional American men’s baseball team. 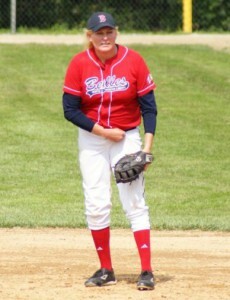 She signed with the Big Bend Cowboys of the Continental Baseball League on March 4, 2010. After successfully completing Spring Training (April 30- May 4, 2010) in Alpine, Texas, Brooks became the first female to make an American men’s professional baseball Opening Day roster since Ila Borders in 2000. Brooks had a brief stint with the team before seeking her own release for ethical reasons and to seek other playing opportunities. Tiffany Brooks is also the first and only female baseball player ever to compete in all three Independent professional instructional leagues,(California Winter League, Arizona Summer League, and Arizona Winter League). She is the first and only female to compete in the California Winter League (2011) and the Arizona Summer League (2011), and one of two to ever compete in the Arizona Winter League (2010). Gaétan Alibert: Can you present yourself and your sporting career so far? Tiffany Brooks: As many people know, I’m really the only American pro-level female baseball player (RHP/1B) at the moment, and one of only two in the world who compete against men. Right now, I’m also the only female position player (as I not only pitch, but also play 1B) in the world at the moment. I signed a contract in 2010 in the Continental Baseball League (Independent Professional –now defunct) and made it through Spring Training and onto the Opening Day Roster. That made me the first Pitcher in the 21st century to sign a pro contract in American men’s baseball, and the first since Ila Borders. Although I was on the roster, I sought my own release from the team a few days later without having the opportunity to take the field. I am the only female member of the Hollywood Legends Barnstorming Baseball team (all ex-MLB players and me) and am the first and only female to attend the California Winter League and Arizona Summer League (pro developmental/instructional leagues) and one of only two to attend the Arizona Winter League. I’m the only female ballplayer to attend all three. I was also told I was the first female to ever play adult baseball in the Netherlands (3rd Division) in its 100+ year history, although I can’t verify that. I’ve frequently been the only female playing in men’s amateur national tournaments, and I’m the only female in our local league, where I play in the highest (18+) division. I started baseball at 4 years old, with tee-ball, then played until I was given no other option but softball, then played Club Team Softball at Gonzaga University, going on to play softball in several countries, appearing in the European Cup and Joudr’s Cup after appearing in the 2005 Canada Cup and the Women’s A/B ASA National Championships. Thanks to my coach Quansio Quant, after picking up a baseball again in the Netherlands in 2007, I was given the opportunity to come back to baseball and haven’t looked back. I’ve recently converted to a submarine pitching style, and am hopeful this will give me the edge I need to be signed to a contract in 2012. Gaétan Alibert: Why did you choose baseball and not softball like others girls do generally ? Tiffany Brooks: Well, first, I would say that I didn’t choose baseball – it really chose me! It has always been a great fit for me. I love the rhythms of the game, the nuances and the pace. Softball is exciting, too, but in a different way. It’s a very, very quick game, and although similar, the two sports are not equivalent. Many men play softball around the world, of course, and are quite good at it (especially New Zealanders), and now there is a growing number of women returning to baseball. So I don’t see either of the two sports as gender-specific in any way. We were playing baseball in the United States long before softball was invented – by men to play indoors in factories, with the “soft”ball invented to not hurt machinery – and around the world, there are more women who play baseball than softball. Another important point is that most girls do not just “choose” softball. Many are forced into it as the only option. I’d like to help change that! Gaétan Alibert: How did you end up playing for a men’s pro team? Was it a draft or tryout? What was your motivation? Tiffany Brooks: Before I signed on with my current agent (Nello Gamberdino at NPG Sports), I had to do all my own communication. I was reaching out to a number of teams to see if there might be any interest in my trying out or getting an invitation to Spring Training. Pure and simple, my motivation was to play baseball at the highest level I was capable of. I saw then, and continue to see, the Independent Minor Leagues as a stepping stone for non-traditional or overlooked players. I sometimes think of the Independent Leagues like the “Isle of Misfit Toys” in the Christmas show “Rudolph the Red-Nosed Reindeer!” We’re all looking for the perfect home. I was really excited to have an invitation to Spring Training, and after a week or so, it turned out I had made the team and the Opening Day Roster. I’m very happy to have had that opportunity, and that it seems to be encouraging more women to integrate and play with men in local leagues. I hope it will also help open some doors for women at the professional baseball level. Gaétan Alibert: Were you welcomed by the the coach, public and players, or did you have to battle sexism? Tiffany Brooks: As you know, America is a large country (in both size and population), and with so much land and diversity in our population, attitudes and culture can be quite different in various parts of the country. Some places are more culturally enlightened than others and treat gender equity in a serious way, while others are more old-fashioned and religion-based and treat women as second-class citizens. Where I signed (Alpine, Texas) was a very Christian, “traditional,” rural place. Most of the people were pleasant to me in the town, and many who saw me play in Spring Training (including several of the Assistant Coaches) were very supportive and believed in me as a legitimate player. Unfortunately, that attitude did not extend to the Field Manager (who was not at Spring Training until the last several hours on the last day), so I moved on to seek other playing opportunities that would preserve my integrity and do honor to all the other women seeking to play at the highest levels one day. In short, yes, unfortunately there is a tremendous amount of sexism still in many places in America. Sometimes that comes from other players, but mostly it comes from old-school managers and coaches or younger ones that have pre-conceived notions of what women’s roles in society are. Most of these outdated attitudes come from the notion that women are lesser beings and that they are incapable of physically competing with men. In developmental and instructional leagues (like the Arizona Winter League), the male players can be a little wary or curious in the beginning, but after they see I can compete, they are normally really supportive and treat me as a teammate. I have many male friends who are ex-teammates – and we stay in contact pretty often. Some male players are not supportive, of course, but most of those are men that believe women exist only for sexual conquest. Beyond the instructional leagues are the actual professional leagues. For me, right now, this is the Independent Leagues, and there is a certain amount of anxiety that comes with playing in them to start with (for most male players), as it’s often seen as the “last shot” at trying to live the dream of making it to the Major Leagues. Many professional players are resistant to having a woman on the team, as they believe it will limit their opportunities at advancement. Because of this backwards thinking, they believe that if a woman can make the team, then they [the male players] must not be very good, so how will they ever be noticed and advance to the Major Leagues? Players’ mothers and girlfriends can be some of the toughest critics, as they sometimes let religion rule their thinking and believe it’s wrong for you to be in a “man’s role” or that you are taking playing time away from their son/boyfriend and thus you are limiting their opportunities to advance. Many male professional players believe having a woman on the team is a joke or is purely for publicity purposes. Although this can happen, my goal is to be viewed as a legitimate, skilled player, whose only job is to help make the team better. It can be a tough road most of the time, but every time it seems to be too difficult, I think of my love of the game, and the girls and women coming behind me who want to play this great game. I think of their notes, e-mails, Facebook messages, and the look in their eyes when I autograph a baseball for them, and that gives me all the determination I need to continue. Gaétan Alibert: Many people don’t want men and women to play together in adult baseball because some say say it’s too dangerous, too athletic for a woman, or that women can’t compete with men. You play with men What is your point of view ? Tiffany Brooks: This idea that it’s too dangerous for women to play baseball with men, or that we’re not athletic enough to compete with men is utter nonsense, and has its roots in the latter part of the 19th century, when a few doctors advanced the notion that somehow physical activity would compromise our reproductive abilities or that we were somehow too “frail” for athletics. I will admit that there are some women who are not athletically inclined, who prefer to not be physically fit, or they willingly put themselves into outdated notions of “femininity” and a subservient role in society – and I absolutely agree that they most likely should not step onto a field and try to compete with men. But the same can be said of a vast majority of men in the world. Not every man is a competitive athlete, and those that try to get on the field without proper training often get hurt. I see it all the time in the local amateur leagues I sometimes play in. Male “Weekend Warriors” come out to play. Many don’t train or work on their overall fitness, so they often get injured or don’t perform well. Women are getting taller and more sturdily built and now know better how to train, so many women can – and will be– competing equally with men in a number of sports very soon – not just in baseball. Gaétan Alibert: Have you played with female baseball teams ? If yes, what are the differences ? If no, why not? Tiffany Brooks: I’ve had the opportunity to compete with quite a few women’s amateur baseball teams. Just like men’s amateur teams, the skill level can vary widely. Some male amateur teams are quite good, while others struggle to make fundamental plays. This is true for female baseball teams as well. As you know, I was fortunate to win a couple of silver medals in women’s international play at the Hong Kong Phoenix Cup for Women’s Baseball. The teams there, and at the Women’s World Cup are quite good, and some could compete against men’s teams. At these highest amateur levels, the differences between men’s and women’s teams are very small or non-existent – but there are a few. I think this will change as women get more opportunities to train, but in general, the women I have played with don’t have as much velocity when they throw, and in general, are not quite as fast on the bases as the average men playing at the same level. As a Pitcher, I find it very challenging throwing to a generally smaller strike zone with female players. The game is basically the same for both sexes as I see it (and the field dimensions are exactly the same), and the style of play is only different in the way players adapt to it. Someone like a David Eckstein or Dustin Pedroia — who are smaller in build — have reached to the highest levels in MLB. To play baseball professionally with men, you don’t have to hit a lot of home runs, throw 90+ mph, or run a world class 60 yard dash – but you do have to have unique skills that will help your team, and I think a lot of female players have that. There are no professional leagues for women in America, so our only opportunities to play professionally right now are to integrate into “male” pro leagues. There aren’t many of us trying to do that right now – but there were over 1000 girls playing High School Baseball last year (on “male” teams) in America, and there are two female players playing college baseball this year. The day is quickly coming where Eri Yoshida and I won’t be the only women in the world playing professionally! Gaétan Alibert: You played in the Netherlands. Would you like to play in other countries? Tiffany Brooks: Playing in the Netherlands was a terrific opportunity, and one that was very friendly. Although I was not playing at the professional level in baseball there, my coach, Quansio Quant, took a big risk in asking me if I wanted to play. I had no idea at the time that no other woman had done that in Dutch Baseball! I was later told I was the first in the 100+ year history of the sport in the Netherlands. I was quite honored, of course, and it told me just how forward-thinking Coach Quant was! I have to thank him greatly for helping me go further in the sport I love. His actions are indicative of one of the things I most appreciate about Europe – in general, there is more gender equity, and women are more often valued for their abilities, not just for their secondary sexual characteristics. In short, yes, I’d love to play in other countries. I’d like to play almost anywhere in the world where there is professional baseball, but I’d be very honored to play again in Europe, especially for a team that would like to take advantage of my experience and knowledge of the game and for whom I would be a valued member of their team. I pitch submarine style now, and have played every position on the field as an amateur, and am a RHP/1B at the pro level. I give baseball and softball lessons, have coached, have pitched overhand and sidearm as well, so I know something of pitching mechanics, hitting mechanics, and good fundamentals in fielding and throwing, so I think in addition to being a player for a team, I could also bring some depth as a veteran player or player/coach. Gaétan Alibert: Do you have any closing remarks for French players? Tiffany Brooks: I do! I have only had the opportunity to visit France once so far, but it was a great experience, and I value your culture greatly. In my own personal history, one side of my family was from the Highlands of Scotland, and after fleeing that country under penalty of death, they settled in France before coming to Canada, and then into the U.S., so I have a very personal, historic connection to France. Many of the women I met in France were strong-willed and able to express themselves in society. This points to better gender equity in France, and great hope for the future of women in sport there. I would urge French baseball teams to explore developing women’s skills in baseball, and look to those female softball players who are very talented — the conversion from softball to baseball is an easy one for most female athletes, and they might just become one of your best players! Finally, the French National motto, “Liberté, Égalité, Fraternité “ says much about your society and the liberated way it views its citizens. Isn’t it perhaps time to expand that to women in baseball? Liberté, Égalité, Fraternité et Sororité ? That sounds like a winner to me! Thank you all very much for taking the time to read this interview. It was an honor to be asked. If you are a French baseball player, I hope one day to be your teammate ! Mister-Baseball.com wants to thank Gaétan Alibert, Tiffany Brooks and the Honus Blog for providing us with the interview.